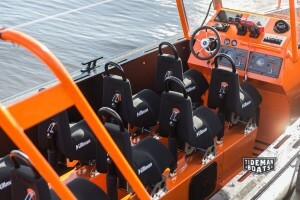 Holland Workboats from Tideman, what are they? Made from indestructible plastic, the Tideman Workboat is an HDPE vessel that is extremely robust and reliable. These holland workboats are practically indestructible and tick all of the boxes when it comes to being environmentally friendly. With little maintenance and high resistance to impact damage, holland workboats offer the perfect solution for many jobs that call for reliability, stability and speed. The old type GRP (Glass Reinforced Plastic) hull could be damaged easily along with the RIB rubber tubes. With vessels like netherlands workboats that are constructed with HDPE (High-Density Polyethylene Plastic), this is not the case. These boats are made to be long-lasting and robust. Because they are lighter than water, they are impossible to sink. WHAT TYPE OF ORGANISATIONS WOULD BENEFIT FROM USING DUTCH WORKBOATS? WHAT ARE THE MAIN FEATURES OF HDPE DUTCH WORK BOATS? These vessels are lighter than water and because of this, they are very buoyant. It is not necessary with a Tidman Workboat to clean marine growth from the hull. We have manufactured an HDPE boat that will never be fouled. Because of this, the boat will maintain its speed, and will always have a smooth, clean bottom. For anyone that is working with corrosive fuels or chemicals, there is zero risk that the boat will be damaged. The Tideman Workboat will not be damaged in a collision with another vessel or even by sharp object or rocks. The boat is available in UV resistant black. This ensures that the hull will never become brittle if it is working in tropical or sunny conditions. We have constructed the Tidman Workboat to be very flexible by using plate welding. The boat can be personalised to your exact needs by adding storage spaces and benches. With our vessels, repair work is easy but probably will never be called for. Work on our boats can be carried out by any plastic production firm or by the owner if he enjoys DIY. All Tideman Workboats have low carbon footprints and are environmentally friendly. Our workboats are completely safe when operating at high speeds. This enables operators to get a job done, quickly, efficiently and above all safely. Our holland workboats are fast, indestructible and environmentally friendly. To find out more about dutch/netherland workboats contact us at our site right now.